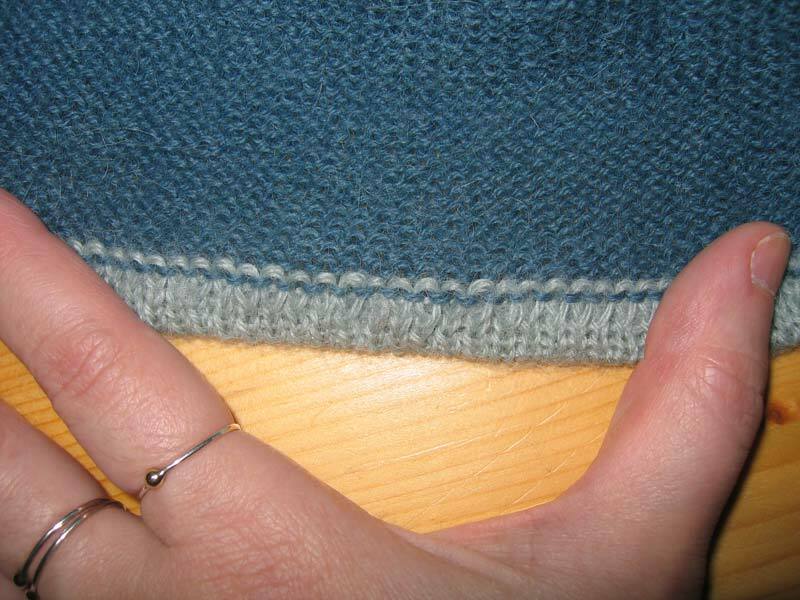 Well, beebonnet asked for a close-up photo of my sweater hem so here it is. Therefore also giving me a convenient topic for a new blog post as I hadn’t done anything post-worthy in the last few days. Here is the front of the hem. It keeps curling which I am hoping will be fixed in the blocking process. 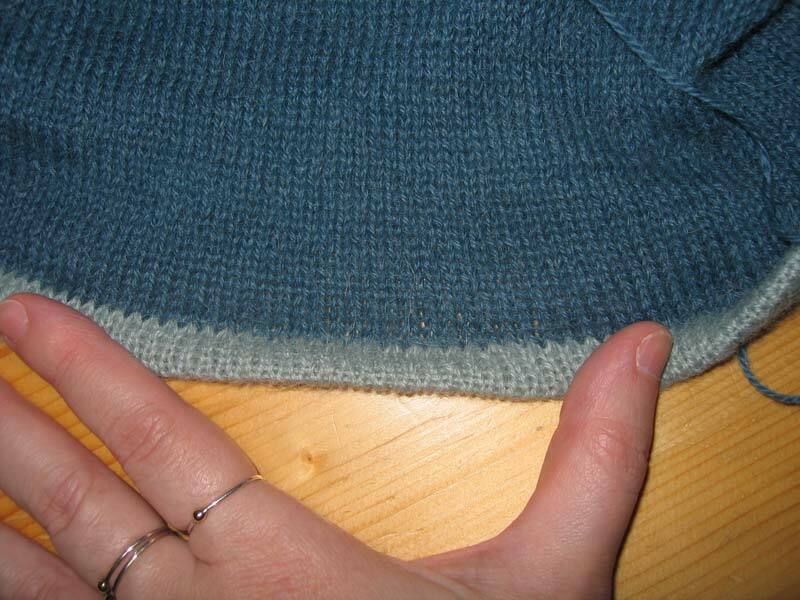 But here is a progress pic on my second sweater effort – the Union Square Market Sweater from Interweave Knits. I’ve got about 6 inches done. 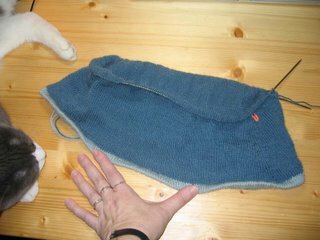 Keep in mind it’s knitted in the round on size 3 needles so a nice chunk of knitting is done. But it is a big project and I still have A LOT to do. 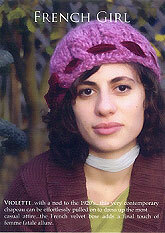 Plus I don’t understand all the directions so I’ll need to ask for the help of my trusty knitting guru, Janel. This sweater has a cool hem on the bottom that I had to do about 5 times over before I got it to work. The technique sounds easy enough when you read how to do it but the actual doing it is much more tricky. 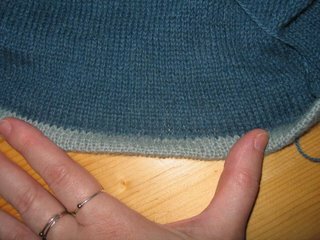 There are some boo boos in mine if you look real close but overall, I really like this way of hemming a sweater. It’s a nice change from a ribbed bottom. Just an FYI, that is Nino, AKA the grey devil, sleeping beside the sweater. Much of his fur is knitted in the sweater. Anyway, I didn’t do much in the way of craftiness over the summer. I live in New York City where the summer is hot and sticky and pretty much the last thing you want to do is touch wool. 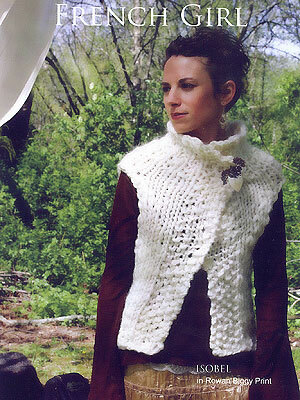 But now that there is a nip in the air I’ve gotten back to spinning and knitting. I finished knitting my Rowan green sweater but no point in posting a photo since the second side looks exactly like the photo I posted earlier – well, I made different mistakes, but whatever. I still need to block it and put it together. Then I’ll post a pic. I did however finish my first project using yarn that I spun myself (from “Indian Wedding” Merino Silk roving that I got from Janel at Chameleon Colorworks) which is pretty exciting. 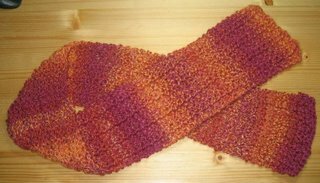 It’s this scarf using a pattern I got from the Yarn Harlot.